For much of the food manufacturing industry, HACCP has been a fundamental programme in managing hazards (pathogens, allergens, chemicals, foreign bodies) associated with the food manufacturing process. HACCP is built upon the requirement for HACCP prerequisites (cleaning and disinfection, personal hygiene, equipment design, maintenance, pest control, etc.) to be in-place, and then concentrates on managing hazards within the food manufacturing process. Hazards that have to be controlled in the process, such that if controls failed there would be a high risk that food would become contaminated, are raised to the level of critical control points (CCPs). Whilst this hazard analysis programme has reduced the possibility of food poisoning, food poisoning alerts and recalls are still published in Europe (RASSF Portal1) and the USA (CDC2). If these alerts and recalls are analysed for the last 10 years, there is little or no evidence of foods becoming contaminated through CCP failures. Rather, food poisoning is related to pre-contamination of raw materials prior to processing (particularly fresh produce) or post-process contamination of ready-to-eat foods. The controls to help prevent contamination in these cases are HACCP prerequisites, and now the attention and focus of the food processing industry is returning to these hazard management essentials. HACCP prerequisites start with the infrastructure of the food manufacturing establishment. It is essential that food processing warehouses and production areas are designed to prevent the entry of hazards (pests, microorganisms, physical debris) from the external environment and to segregate hazards (allergens, raw/cooked materials) within the food manufacturing environment. The building structure must also not harbour hazards and this can be best achieved by building suppliers such as floor slab layers, drain installers and floor finish suppliers, working together to ensure that building elements such as floor/drain interfaces are durable and do not fail and become hazard harbourage points. Similarly, pest control contractors should work with building suppliers to ensure that everything is done to make factory sites unattractive to pests and building elements that are difficult for pests to penetrate. Managing pests within food factories is often too late! Within the factory, food contact surfaces, food processing equipment, utensils, surfaces and ancillary equipment such as cleaning equipment should be constructed of approved food contact materials wherever possible. The principles of hygienic design, as proposed by e.g. the European Hygienic Equipment Design Group (EHEDG3) in Europe, should also be incorporated for all equipment, services and ancillary equipment. This will ensure that such equipment and utensils will neither transfer hazardous construction materials to food nor, via their design, harbour microorganisms and allergens or allow the contamination of food products via e.g. fastenings or lubricants. To maintain their hygienic performance the food processing infrastructure and equipment must be managed by planned maintenance schedules which recognise that replacement parts should be replaced when their hygienic performance deteriorates, which may be prior to their performance failure. Organic, inorganic and microbial soils are removed from the manufacturing infrastructure at the end of production by cleaning and disinfection programmes, designed for their specific soil characteristics. Cleaning and disinfection is also becoming more important in its role in managing hazards and in many cases, end-of-production cleaning and distribution is the control barrier used between e.g. food materials with different microbial loads, allergen containing and non-allergen containing products, or different animal DNA’s e.g. beef and pork. Such cleaning methods must be fully validated and then effectively monitored and verified. Food operatives are also recognised as potential risks via their carriage of microorganisms and other hazards on their hands and clothes. Changing procedures are designed such that outside clothing is removed, outside footwear is removed and then operatives cross a barrier (e.g. a simple line on the floor or a bench in higher hygiene areas) into the food processing environment where they immediately wash their hands and don food factory footwear and clothing. Separating all non-food processing operations such as boiler houses, maintenance rooms, canteen and rest areas from food processing area via such barriers, limits the potential for hazards to be introduced into food processing areas. The barriers can also be used to reinforce psychological messages such as “you are now entering a food processing area” which may engage a hygienic work ethic within the operatives. Attention to HACCP prerequisites is thus fundamental in managing food contamination hazards and ensuring food safety. Any new technologies that can aid in the design, maintenance and management of the food processing infrastructure, including food operatives, is welcomed and should be fully explored. 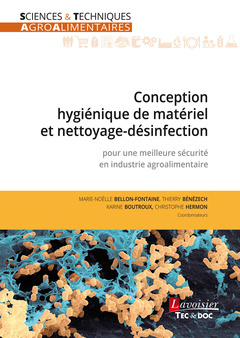 Ingénieurs et techniciens des unités de production des industries agroalimentaires et des bio-industries, équipementiers, professionnels du contrôle sanitaire (techniciens d’analyses et instances officielles) en charge de la surveillance de l’hygiène du matériel, des usines, des aliments et des bioproduits, enseignants-chercheurs et étudiants dans le domaine de l’agroalimentaire et des bio-industries. • Marie-Noëlle Bellon-Fontaine est professeur à AgroParisTech (Massy). • Thierry Bénézech est directeur de recherche à l’INRA (Villeneuve d’Ascq). • Karine Boutroux est animatrice du réseau national « Alimentation et Ateliers technologiques » à la DGER/ministère de l'Agriculture, de l'Agroalimentaire et de la Forêt (Laval). • Christophe Hermon est directeur du pôle région Ouest du CTCPA (Nantes). Retrouvez tous les ouvrages de la collection de référence Sciences et techniques agroalimentaires des éditions Lavoisier.